Chevrolet built nearly half-a-million copies of their crazy popular Impala in 1961, and to capture even more of their customer’s hard earned dollars, a new Super Sport appearance package was added to the options list. There were no actual performance upgrades to the 1961 Impala SS, but your grandpa could pair its sport suspension and spinner hubcaps with a 360-hp 409ci V8. The SS option proved popular, and eventually migrated to the first-gen Camaro, where it could be had with either a 350 V8 or the all-mighty 396 big block. Fast forward to the 6th generation Camaro, and the SS package is the only way to get a V8 engine (outside of the Camaro ZL1). And since life in the modern era has to be complicated, the Sixth Gen Camaro SS can be ordered as a 1SS or a 2SS. The difference between a Camaro 1SS and Camaro 2SS has to do with the features. In a nutshell; a 2016 or 2017 Camaro 1SS is the entry-level model with all of the performance goodies, but none of the fancy luxury features. A Camaro 2SS on the other hand, is loaded down with fancy tech, interior materials, and a trick, adjustable color head-up windshield display that can project information such as vehicle speed, selected gear, tachometer, g-force, outside temperature, turn-by-turn navigation, and audio system information. Both the Camaro 1SS and Camaro 2SS get the 4-mode Driver Selector System w/ launch control, and it can adjust the loudness of the optional $895 Dual Mode Exhaust system. As well as the firmness and response of the $1,695 Magnetic Ride Control active suspension. But no matter which 2016-2017 Camaro SS you get, it’s going to have the following features: a 6.2L LT1 V8, an external engine oil cooler, Brembo 4-piston brakes front & rear, a limited-Slip differential w/ cooler, a transmission cooler, quick-ratio ZF electric power steering, Driver Selector Mode (Snow/Ice, Tour, Sport, and Track), 20-in wheels, a rear spoiler, HID headlamps, a backup camera, an 8-in touchscreen w/ Apple CarPlay/Android Auto (you can even watch movies on it when you’re in Park), WiFi hotspot capability, and keyless entry/ignition. 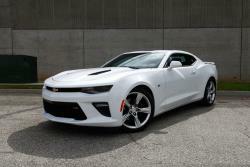 Opt for the $5,000 Camaro 2SS package, and you’ll get luxury accouterments like heated and ventilated leather bucket seats with memory, fancy leather and aluminum-look cabin trim, a heated flat-bottom steering wheel, 24-color mood lighting, illuminated door sills, dual-zone climate control, a wireless charging tray at the back of the center console, Bose audio, rear cross traffic alert, side blind zone alert, rear parking assist, and the head-up display. Available on the 2017 Camaro 1SS coupe w/ 6-speed manual transmission (no automatic is offered), this $6,500 option package transforms the muscle-bound SS into a track day superstar. No performance modifications are made to the engine, but the entire chassis is tweaked to deliver over 1 g of lateral grip in the turns. Some of these improvements include specially calibrated Magnetic Ride active shocks, stiffer springs, large diameter sway bars, an electronic limited slip differential (eLSD) with 3.73 gears, 6-piston Brembo brake calipers, 14.6 inch two-piece brake rotors, and bespoke forged aluminum wheels wearing sticky Goodyear Eagle F1 tires. There’s also a front splitter, rear diffuser, matte black hood wrap (actually helps to reduce glare), matte black exterior bits, Recaro bucket seats, and fake suede covers on the steering wheel and short throw shifter. To keep the drivetrain temp in check, the Track Cooling Package adds high-capacity oil, transmission, and differential coolers. The Dual Mode Exhaust is included as standard equipment on the Camaro 1LE. But the PDR video/data recorder is an extra cost option. 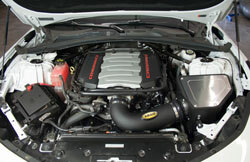 Under the hood of the 6th generation Camaro SS is an all-aluminum 6.2L LT1 V8, with a raft of new technologies like direct injection, variable valve timing, and active fuel management (which shuts down four of the cylinders to achieve better fuel economy on the highway). This is the fifth generation of the legendary smallblock Chevy LT1 V8, and it took over 5 years to develop. Among the many power enhancing features that you're never going to see are special piston heads that are sculpted to allow for an insane 11.5:1 compression ratio. There’s 8 oil jets that spray the underside of each piston and cylinder to cool them down. The 4-into-1 exhaust manifolds are tuned to evacuate spent gases with minimal restrictions. And the intake manifold was engineered to provide a straight-shot path for the aircharge to reach the huge 2.13-in intake valves. AIRAID can even help you turn this feature into even more horsepower. But more on that in a moment. AIRAID 850-047 Direct Fit Replacement Air Filter - Air filters are designed to keep dirt from getting sucked into the engine, where it can damage the piezo injectors and piston rings. The problem is, that OE Camaro SS air filter is made from thick paper, and all of that dirt will get trapped on the surface, preventing a majority of the incoming air from ever reaching the engine. 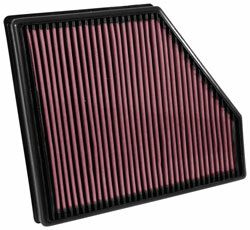 An AIRAID performance air filter on the other hand, eliminates airflow restrictions so that Chevrolet LT1 can make all of the horsepower that it was designed to make. Plus, it’s reusable, and comes with a Lifetime Limited warranty. In order to make power, the 6.2L LT1 intake manifold has been designed to deliver air to the cylinders, with fewer turns and narrow passages. 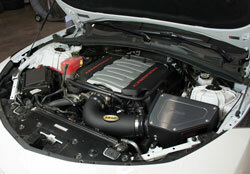 However, the stock Camaro SS intake system is actually full of airflow restrictions. For example, the paper air filter can clog and block airflow, while the ripples in the stock intake tube will cause air to become turbulent. 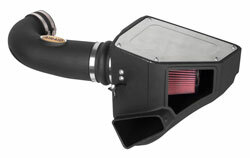 To address these issues, AIRAID developed a pair of Camaro SS cold air intake systems that can deliver an estimated increase of 10-hp & 10 lb-ft of torque. This extra power was measured at the rear wheels, not at the flywheel. And it comes in at lower RPMs. So you will experience stronger off-the-line acceleration (especially when you activate Launch Control) and more passing power at higher RPMs. 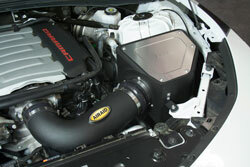 The difference between these two AIRAID cold air intake systems is in the air filters. The AIRAID 250-333 MXP performance intake system uses a specially designed SynthaFlow air filter, which is made from multiple layers of oiled cotton gauze and synthetic material, sandwiched between two layers of sturdy wire mesh. The AIRAID 251-333 MXP performance intake system uses a dry SynthaMax performance air filter, which is made from a proprietary synthetic material that can stop dirt particles that are smaller in diameter than a human hair. Both systems use a rotationally molded high-flow intake tube that features an integrated velocity stack to increase the speed of the air charge entering the cylinders. This allows for a much better fuel/air mixture, and more torque at low RPMs. There's also a built-in fitting for the factory MAF sensor, so the system can be installed without making any ECU programming modifications.